On January 15th, witness the crowning of all the NHRA Division 2 Champions live from the annual awards banquet. The festivities begin at 8PM and can be viewed for free at www.nhrabanquet.com. Live audio and video feed courtesy of mobilecast-live.com. Brisbane drag racer Debbie Reed continues to rest following her qualifying crash in her Allstar Batteries Top Alcohol dragster during round one of the 2011 New Year Series at Willowbank Raceway. 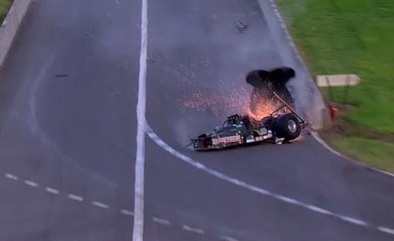 The incident occurred after the 51 year old grandmother-to-be, who has over 30 years of drag racing experience, crossed the finish line during her first qualifying run in the Top Alcohol category. Husband Steve Reed, also an experienced Top Alcohol racer, said while he has experienced all of the highs and lows of drag racing first hand, including a spectacular crash of his own at the same event in 2009, it was something completely different when it was happening to his wife and mother of his two children, who are also involved in the sport. I had made my pass before Debbie, so I was back in our pit area watching from the finish line, I saw that she was in a bit of trouble, and thought the worse, so I jumped in the nearest car and headed to the braking area, said Steve Reed. John Force, a 14-time NHRA Funny Car world champion, has traveled many roads in the sport of drag racing. Once upon a time, he was a struggling drag racer trying to find his niche. The classic YouTube video comes from the 1979 Diamond P race coverage of the NHRA World Finals in Ontario, Ca. In today's Classic Video Rewind, we unveiled one of drag racing's earliest broadcasts aired on ABC's Wide World of Sports. In the past, the NHRA used this medium as a means of gaining television coverage for its annual Winternationals and in some seasons, the U.S. Nationals.